The bright areas visible here on the Sun are facula. A false-color photograph of the Sun taken by NASA’s Solar and Heliospheric Observatory (SOHO) satellite on 7 February 2007 at 13:37 UT. 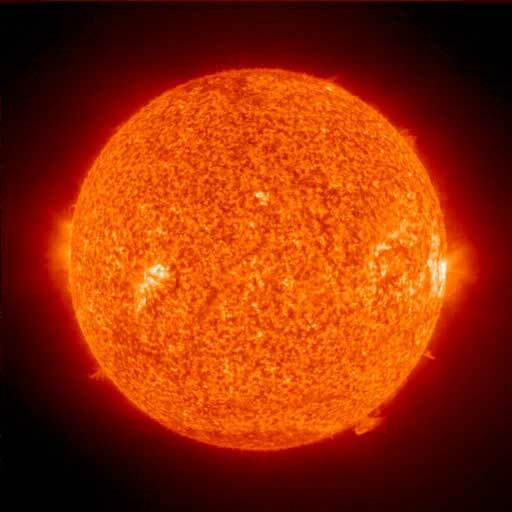 This photograph was imaged through a narrow-pass filter in the near-UV at the He II Ly alpha resonance line at 303.7 Å. Prominences can be seen around the limb of the sun. The bright areas on the sun’s surface are faculae, which are hot areas often associated with nearby sunspots. A facula (plural: faculae) is literally a "bright spot." It is used in planetary nomenclature for naming certain surface features of planets and moons, and is also a type of surface phenomenon on the Sun. Solar faculae are bright spots that form in the canyons between solar granules, short-lived convection cells several thousand kilometers across that constantly form and dissipate over timescales of several minutes. Faculae are produced by concentrations of magnetic field lines, and are most commonly found in the vicinity of sunspots; this is why the Sun is actually brighter when sunspots are more numerous.